In August 2016, Atkinson & Rapley, launched the first, broad-spectrum, stereo, USB recording interface with custom microphones - Scribe. The system comes complete with broad-spectrum recording software for any Windows-based personal computer. In August 2016, Atkinson & Rapley, launched the first, broad-spectrum, stereo, USB recording interface with custom microphones - Scribe. The system comes complete with broad-spectrum recording software for any Windows-based personal computer. After the successful release of the Scribe Mk1 in Australia in 2016, and its subsequent successful field trials in New Zealand, Australia and Europe, an enhanced Mk 2 system was put on the drawing board. Pricing has yet to be finalised for the Mk 2, but there will be a standard commercial price for industry users and an academic price, with appropriate discount, for research institutions. Noise-impacted residents may request a special price and will be encouraged to join the Citizen Science Initiative - CSI, to share their data for scientific research purposes. Conditions apply - please enquire. Preorders are now being accepted for February 2017 production. Contact arg@paradise.net.nz for more information. A brochure follows this press release. Simultaneously capture the indoor and outdoor acoustic environments. Houses can greatly change the sound character, so recording both is essential. Capture infrasound as well as audible sound to standard sound files. Everything is captured because anything may be important. 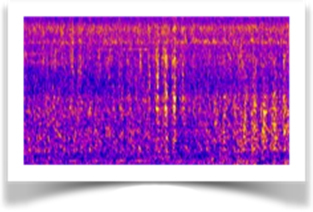 Sonogram of wind-turbine ‘swish’ (vertical bars). 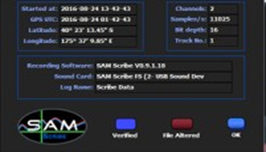 SAM Scribe is an industrial-strength recording system that’s ahead of the competition. It will faithfully record sound from 0.1 Hz (infrasound) all the way up to 20 kHz, the upper limit of human hearing. This means that it will capture all of the sound created by any industrial plant and other noise sources, record them as evidence, and allow later analysis. With the use of a Type 1 sound calibrator, SAM Scribe, with its near-flat response, can capture acoustic environments with industry-standard accuracy. Capture the GPS position of the recording and the exact time using the precision of the GPS satellite system. Take continuous recordings for months at a time by adding an external hard drive, or use a USB memory stick for more portable external data storage. SAM Scribe stores information about the recording as metadata within the sound file, including the GPS location, the GPS- derived time, the sound card details and the software version. A digital signature is then created for the file contents and encrypted by the supplied security hasp. At any later time, by verifying the digital security signature, you can be assured that the sound data and metadata in the file have not been tampered with. This can be useful in future litigation. SAM Scribe records sounds with industry- standard accuracy. It produces standard, uncompressed WAV files that can be opened and played by countless programs. Listen to them on headphones and boost the volume or perform your own analysis using free, third-party software to visualise the acoustic environment. Capturing an acoustic environment with laboratory-grade accuracy means that it c a n b e a n a l y s e d l a t e r w i t h o u t compromising on detail or missing acoustic features of the environment. Laboratory- grade recording offers the opportunity for laboratory-grade analysis. When you purchase SAM Scribe you can join the Citizen Science Initiative on Acoustic Characterisation of Human Environments (CSI-ACHE), gathering evidence on the impacts of industrial noise on people. 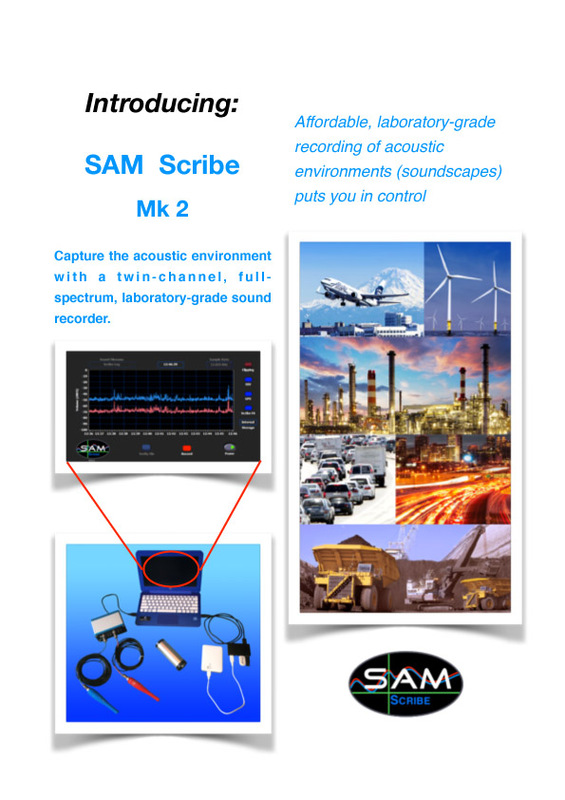 Capture your own acoustic environment using SAM Scribe and our professional operating protocol. Upload your sound files to have them analysed by independent experts.